Dito Montiel's sophomore film, "Fighting", is just as electric and startling as his debut 2006 effort, "A Guide To Recognizing Your Saints"... and I was still the only one in the theater on both occasions. Whether it's the film's premise of underground fighting or the lackluster advertising, another Montiel film is relegated to eventual seek-and-find status on home video- a bleak outlook for such a gifted and realized young director. Starring his now apparent alter-ego Channing Tatum, "Fighting" holds a simple premise that unfolds in natural and unhurried fashion. Struggling for cash daily, selling bootleg Harry Potter books and Video Ipods on the street for $20, Tatum plays Sean MacArthur. One day, after a failed attempt to steal his stash of already probably stolen merchandise, Sean meets Harvey (a deceptively good Terrence Howard with a true 70's cinema name). Harvey realizes the raw talent in Sean to defend himself with his knuckles and the two soon develop a friendship that includes the entry into the high stakes world of underground fighting- although "underground" is a relative term since every fight is a distinguishable and unique setting perched somewhere high (or dark) in and around New York City. Along the way, Sean meets Zulay (Zulay Henao), a struggling waitress in a high class bar and the two form a relationship. Also embedded in this survival story are some illusions to Sean's volatile past, which eventually manifests itself in a fight between an old friend. With just two films under his belt, I'm fully ready to proclaim writer/director Dito Montiel as a young autuer in the making. Both films reveal a talent beneath the surface that's boiling to create something truly great. In "Fighting", he takes the well-worn genre of the masculine showdown movie (think horrid teen precursors like "Never Back Down") and turns it inside out, developing smart characters and tender interactions between Sean and Zulay that far exceed the genre's usual play-by-numbers approach. As a director of actors, Montiel seems to already have that figured out as well. The initial meeting between Howard and Tatum on the street is handled with intelligence. Just watch how Harvey tenuously keeps his distance from Sean, clearly laying out his expectations. It's a small moment, but one that feels very true. Likewise, Montiel is adept at displaying the awkward fits and starts that encircles every relationship at the beginning. The scenes between Zulay and Tatum are wonderful. The framing from outside a cramped NY apartment window as the two carry on a late night conversation.... the nervousness in an apartment stairway... Montiel has already made a burgeoning career of young love developing on fire escapes and hallways and it all feels so right. And then there's the fighting... the part of the film which is sure to bring in over 90% of the crowd. It's visceral. It means something. Very few films can capture the escalating moral or metaphysical consequences of their finale. P.T. Anderson's "There Will Be Blood" does it. Spike's Lee's "He Got Game" does it best. Montiel's "Fighting" is very close. It's bone crushing and stark, but it's win or lose outcome envelops the whole thing which only increases the audience's tension level and validates that Montiel has crafted a film that resonates on several levels. Nacho Vigalondo's "TimeCrimes" made a small splash in cult cinema circles last year, most notably from its inclusion in Fantastic Fest hosted by Ain't It Cool News. Granted, anytime a small independent film chooses as its subject time travel, the accolades come hard and fast due to the film's scruffy, intellectualized subject (see "Primer" from a few years'a go... a film whose praise was lost on me after finally seeing the film's baffling concept. It was filmed in Dallas though) But Vigalondo's film does deserve the praise. 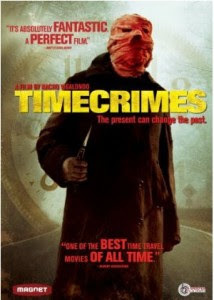 Visually unoriginal (since it was filmed for Spanish TV), "TimeCrimes" relies on a twisting, highly original idea to carry the film for its brisk but near perfect 95 minutes. I suppose if you think too hard on the film's structure, a few plot holes exist her and there. But really, what time travel idea isn't riddled with holes? "TimeCrimes" mounts doppelganger upon doppleganger until the film begins to hurt the brain as the viewer hastily tries to piece together the various timelines and switcheroos. It's all terribly exciting and handled with restrained tempo by Vigalondo through careful camera composition and an unnerving sound design. Without going into too much plot detail, "TimeCrimes" loops some very serious questions around it's heady time travel scenario. What would we do if we were seemingly invisible and adverse to cause and effect? Are we destined to repeat our circumstances or do we have the power to change the seemingly hidden pull towards the inevitable? As Hector (Karra Elejalde), one of only 4 characters in the film, the beating compass of morality and choice lies with him. After a serene opening in which he and his wife have moved into a new house in the country, he takes up gazing across his backyard with a pair of binoculars. A few minutes later, he's beginning to become wrapped up into a mystery that echoes the razor sharp economy of image and sound inherent in Hitchcock's cinema of voyeurism. He sees a half naked girl posing for him. A wrecked vehicle. And Hector eventually comes face to face with a looming figure, complete with bloody-bandaged face and all, who forces a game of hide and seek through the woods. From there, "TimeCrimes" opens up a pandora's box of future and past timelines as Hector desperately tries to erase and manipulate the horrific events. Based on one short film and now "TimeCrimes", it's clear the wave of Spanish invention in cinema is far from over. Del Toro, Amenenbar, Bayona... these guys are taking up the genre picture (horro and sci-fi specifically) and churning out refreshing spins that continue to grow upon repeat viewings. Now add "Time Crimes" to that list. I look forward to whatever Vigalondo does next. Imagine this scenario. You're part of an indie rock group that's been playing the fringes of the big-time for several years now. An appearance at SXSW once. A late night Coachella venue. You have some hometown notoriety. You've produced a few records on a local label and are subject to a growing (but cultish) following. Then, a movie studio uses your song in a trailer for one of their upcoming movies and, suddenly, the rivers are parted and you're the 'next big thing'. Several bands certainly call that fictional scenario a reality. Case in point: Montreal indie band The Arcade Fire. Now, I'm not suggesting that The Arcade Fire needed any help. They were already far along their path to international success before Warner Brothers prominently featured one of their best songs in the trailer for Spike Jonze's "Where the Wild Things Are". But listening to XM radio this week, they claimed that The Arcade Fire shot up very high in their Top 10 down loadable artists last week... the first time this band has been in such a list since debuting their masterwork album "Funeral" almost two years ago. How's that for instant regurgitated success? Part of me loves the idea that a two minute trailer spot can expose a well-loved niche band to the mainstream currents of pop culture. And then the musical snob in me recoils at the fact that this band- which I've regarded as a well kept secret for two years now- is finally being discovered by this same mainstream current. Still, The Arcade Fire are not the first band destined for greatness via viral campaigning... and they certainly won't be the last. Indie bands are popping up on trailer spots all over the place. Muse (for it's placement in "The Watchmen"), Sigur Ros (for, take your pick of any number of trailers including the new Disney Earth or my personal favorite from "Children of Men") and MIA (Paper Planes) and Cat Power are some of the latest crop of artists to gain popularity from the movie industry. And then there are the X-Box video game spots which have added tons of new fans for bands like Devotchka and sent people scrambling for the various covers of the song Mad World. So what do we owe all of this? Is it studio and movie executives making a deal with the devil to even further proliferate their billions of dollars profit? Nah. Not likely. The simple answer... certain music lends itself naturally to visual images. How many times have you listened to a song and suddenly gotten flashes of a visual image that seems to rhythmically blend with the sound? Or is this just me? The common denominator in all these above mentioned trailers and ads is that the music does seem to enhance and embellish the images. Before the trailer, I really had no interest in seeing Jonze's latest. Now, my interest is piqued to say the least. Two minutes of success for the The Arcade Fire, and nine more dollars from my pocket to Warner Brothers later this year. Seems like a good trade-off, no? Mabrouk El Mechri's "JCVD" falls squarely within the design of a film that could drown amidst its self-reflexive pretense. From the energetic opening shot (in which international action star Jean Cleade Van Damme flails and kicks his way through a long take of attacking soldiers), "JCVD" calls attention to itself as a sort of joke on filmmaking and the star's bigger than life personality. But "JCVD" also maintains some real heart and (gasp) acting chops from its leading man. Playing himself- albeit down on his luck, forging through a considerably painful custody battle over his daughter, and flat broke- Van Damme strolls into a post office where he's immediately caught up in a bank robbery. The film dances circles around the robbery, showing us the hostage situation and ensuing police negotiations from varying perspectives. Inter cut throughout the robbery are glimpses of Van Damme's personal troubles, handled with gentle humor and introspective flashes of brilliance such as a six minute monologue spoken directly to the camera in which Van Damme ruminates on his life as boy, drug addiction and the manic life of being a star. In certain situations, this scene could have come as leaden and overwrought. Van Damme and director El Mechri make it work. And the rest of the film works magically as well. We expect Van Damme to save the day... and part of the joke of "JCVD" is the realization that, like any other 'star', he's a fabricated personality that won't be able to save the day when reality crashes around them. And the final scene between Van Damme and his daughter is a stunner. See this film when possible. It would seem almost too easy for a film like "Adventureland" not to fail. Add catchy 80's pop tunes by the likes of INXS, The Cure, Husker Du, toss in the improvisational comedy of Bill Hader and Kristin Wiig, star two energetic and likable young stars (Eisenberg and Stewart) and milk off the success of indie-rock tales such as last year's "Nick and Nora's Infinite Playlist" while treading closely to the Apatow brand. Well, "Adventureland" doesn't fail. In fact, it pretty much works itself out into a tender and low-key comedy-drama that distances itself from all the above cloying aspects. Written and directed by Greg Mottola- who finally has seemed to cash in on the buoyant pedigree started almost ten years ago with the fabulous "The Daytrippers", his debut- "Adventureland" is the smart telling of one young man's revelatory summer working at a Pennsylvania amusement park and finding himself in love for the first time. Of course, young love doesn't come easily- as we've all figured out. But what Mottola captures is something special... the way he films the hands of Stewart and Eisenberg touching as they kiss..... the little lean-in he does underneath a sky of fireworks.... and the precise comic timing of Martin Starr as he yells out "ow... that was a whole corn dog!"... everything fits and describes a carefully understood time and place. "Adventureland" is the type of film that makes one reminisce about their own awkward staggerings through young love, and for me it even brought back a rush of sounds and feelings. And, the final scene stands as one of the most uplifting and breathless endings in quite a while. A vulgar, white trash karate instructor. A mall cop with delusions of grandeur; Granted, the anti-heroes in Jody Hill's darkly cynical worldview of "The Foot Fist Way" and now "Observe and Report" don't beg for our sympathies or kinship.... but they're still loners at the fringes of society who ask us to laugh at their increasingly morbid and icky stabs at normalcy. I don't find either one that incredibly funny, but I do admire the go-for-broke attitude that "Observe and Report" displays on mainstream American films. While Seth Rogen's bipolar mall cop asks that we suspend disbelief that any company would keep the guy employed after his first altercation with police officer Ray Liotta, maybe this whole film takes place in his delusional head. That's the only reason I can find for it's inconsistent tone and complete alliance with characters who propel the myth that brain-dead white trash is still funny long after "Reno 911" and "Talladega Nights" have run their course. I really hate the path most modern comedies take. Everything is broken down into two camps: the improvisational comedy that stretches itself into unfunny oblivion (see any Will Ferrell movie) or gimmicky crotch shots (see "Observe and Report"). When a comedy comes along that understands the value of comedic timing, I get excited. "Observe and Report" is a prime example of a comedy that tries to push the envelope and loses sight of its small goals. The funniest part of the 100 minute movie? A small exchange in the beginning of the film- being interviewed by a local reporter, she calls Rogen mall security. He lashes back with a string of profanities and tells her he's head of mall security. When she continues the interview, he asks her "you still wanna continue after you f'ed up my title? Ok, I'm standing here being interviewed by this doctor..." Rogen's reading and the set-up has the rhythm of a well told joke, but the rest of the film is wasted in ugly portraits of drunken mothers, pervert co-workers and clueless police men who show up like keystone cops. If only the rest of "Observe and Report" had been as sharp as that exchange, we might have something. Instead, director Hill has taken the path of prankster who refuses to believe there's any intelligence in this world. If I haven't stated it enough over the past couple of years on this blog, Johnny To is one of the most prolific and creative Asian directors working today. And when I say prolific, I mean it. Since the fall of last year, he's got three films in various stages of release. I'm still waiting on his well-received film "Sparrow" which has been cited as an extremely savvy and entertaining portrait of a group of pickpockets. His latest film, Vengeance, just received a very cool trailer this week and count me in! Somewhere in-between the above films, "Mad Detective" circulated on the festival rounds last year and I finally got a chance to see it. Those unfamiliar with To's work should know his films are often poised between two distinct types- there are his hyper-stylistic gangster films such as his "Election" films, "Exiled" and "Full Time Killer" and then the more playful genre films such as "Throwdown", "Yesterday Once More" and "Running On Karma". "Mad Detective" falls soundly in the latter category. Ching Wan Lau, To's alter ego, stars as detective Bun who uses his magical ability to place himself in the shoes of a killer and re-enact the crime with perfect clarity. After a nervous breakdown (in which he slices off his ear and gives it to the police chief as a retirement gift), Bun leaves the force. 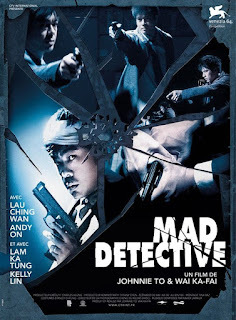 Inspector Ho (Andy On) takes over his duties, but finds himself seeking out Bun when two cops on a stakeout chase a suspect and one of the cops never returns. But, really, I'm leaving out the most entertaining aspects of this film. "Mad Detective" continually questions the sanity of Bun, along the way revealing to us that he not only uses his ESP-like abilities to solve crimes, but he can see the inner person of everyone he meets. This becomes increasingly important when the partner of the missing cop enters the scene and Bun identifes six seperate personalities within him. It's this type of vibrant and alarming lunacy that propels the films of Johnny To, threatening to sink the whole thing, yet he always maintains a firm and fantastical edge. Case in point- in one scene Bun and Ho go out to dinner and Bun constantly talks to his wife, only visible to him.... and when Bun decides to jump on Ho's motorcycle and give her a quick ride, To frames both of them on the bike, speeding along with huge smiles on their faces. Whether it's real or not, it's these types of bullient moments that infuses To's films with a go-for-broke freedom that fills me with so much joy. "Mad Detective" also carries on some of the usual tropes in a To film. One of the major plot points revolves around the missing service revolver of a police officer.... a device brought to lucid realization by Kurosawa's "Stray Dog" in the late 40's and a recurring idea in several Johhny To films. And, not one to deviate from the violent and balletic displays of gunfire, "Mad Detective" serves up a finale shoot-out in a hall of mirrors that loudly reverberates the prismatic shades of its main character's mind. Part of the enormous fun of a Johnny To film is the wild and chaotic shifts in mood and tone that come at you feverishly. If you're not digging the vibe, give it a minute and it might change. "Mad Detective" does this with abandon. And the final scene, as Inspector Ho wanders the room trying to get something right, To raises a significant question- where does right and wrong in our police officers start and end? Bourgeoiss Surrender contemplates his initial thoughts on the French New Wave, or the "Great Thing" as he calls it. Sam at The Listening Ear takes a critical look at the French New Wave and dissects it into some very interesting points. 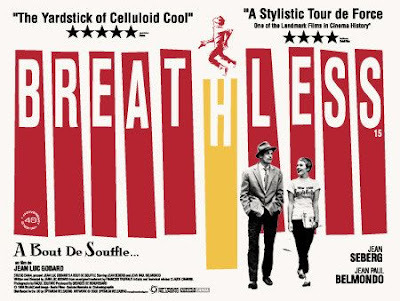 Sam follows it up with a second post about one of my personal fav New Wave films, Godard's "Breathless". I was hooked. The way the camera breaks the fourth wall, Georges Delerue's lush and evocative score (which still stands as my favorite of all time) and the totally superfluous lens changes as the camera lovingly traces over Brigitte Bardot's flawless body. This was cinema pertaining to style and mood, with a little story thrown in for good measure. I'd never seen or felt anything quite like it. Truffaut's "Jules and Jim" and "Shoot the Piano Player" were next. Which led me to Jean Pierre Melville. Which led me back to Godard's "Breathless". Which led me to 45 plus films of Claude Chabrol. And with each new venture, I could feel my wonder and amazement evolving as if I'd discovered something highly secretive. This "love affair", if you will, with the French New Wave continues even today. There are times when I recognize a stolen moment or idea from one of the nouvelle vague greats... and I always smile. 50 years plus, and those lightning bolts of cinema still produce charges of greatness. There are film movements today that almost rival the energy of the French New Wave. Asian cinema, in particular, continues to ebb and flow with true masters (Johnnie To and Chan Wook Park) while the newly christened Romanian film scene is emerging as a force to be reckoned with- if only it contained more than 5 or 6 features. But the French New wave were different. The original 'film brats' (who mostly wrote and devoured movies and prodded hidden/unrecognized gems of brilliance from the studio films of Hollywood) they understood the rules... which in turn gave them permission to break them. They unleased a flurry of playful ideas based in the old genre tropes. We need disruptive voices such as these to keep things fresh, extroverted and creative. For the French New Wave, nothing else than those words applies. Tomorrow begins the French New Wave blogathon. If you'd like to participate, simply comment and post a link or you can e-mail me at Henryhill51@aol.com. The blogathon will run Thursday April 9th through Sunday April 12th. I'll update daily. I have to admit. This has been fun. From the draft (which, I quickly learned must be taken seriously and forced me to put down my beer and concentrate) to arranging the roster for opening day, any true baseball fan will get undeniable joy from it. Crunching numbers... keeping up with DL reports... playing the odds on when to sub in your bench players... it keeps you greatly invested. 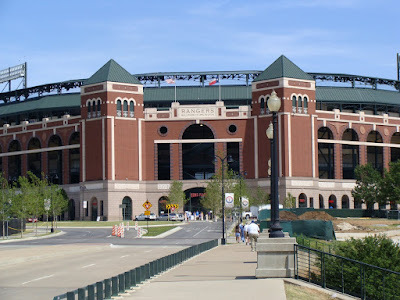 Granted, my list is a bit American League heavy (Rangers fan, remember) and I think I need to stretch myself more next time and expand my knowledge on NL players, but I look forward to enjoying the baseball season a little more this year. Oh yea... and I got Matsui! I've just finished listening to the first great album of the year- Beirut's "March of the Zapotec/Real People". Beirut is really just the brainchild of young singer Zach Condon. Influenced by Eastern European "folk" music (much like Denver band DeVotchKa), Condon's latest installment of smart and get-under-the-skin sounds is a magisterial blend of two divisive types of music. The first half resembles his earlier sounds on "The Gulag Orkestar" and "The Flying Club Cup"- a crashing (but completely moving) blend of horns, violins and Arcade Fire-like makeshift instruments. The second half of his latest EP (the RealPeople section) dives deep into low-key electronica. Blink and you may think it's Thom Yorke singing.... but Condon is a unique individual whose voice pierces whatever sound he chooses to infuse into his eclectic mix. It's all wonderful and sublime. Here's a sample from the RealPeople section of the album, my favorite song on the record titled "Venice". Beirut only has three albums out, so do yourself and favor and catch up quick.